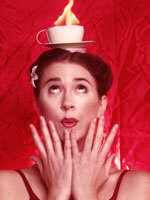 Join us for a fun interview with Lindsay Benner, juggler and variety performer from Los Angeles. Upon opening her “Quest for Love” show, she had three people show up for the first show. She talks about what happened and what she learned from this experience. Lindsay had the opportunity to perform for one of her idols, Bill Irwin, in a benefit event. In fact, she was picked by Bill, to be the closer for the variety show! What would she have done different? She’s pretty satisfied with how things are at the moment and wouldn’t have done anything differently. She’ll keep moving forward though! The way Lindsay differentiates herself from other performers in her genre is to play up her femininity, since women in variety arts, other than burlesque, are rare (though becoming less rare these days). It’s seemed to have worked well for her so far! Listen to Lindsay weave an interesting story about street performing, and a guy they endearingly referred to as $h!t Man. • Street performing and her drive behind that. • What’s been working for her business-wise? • Talks about what a day on tour is like. Listen to what delights you and makes you happy. Listen to what gets a good response and “reads” well with your audiences. Combine the two. Think of your audience as an instrument that you play. Mirrors. Big mirrors that take up the entire wall! Lindsay uses these to play off of, making faces to find out what “reads” for her as she works on silent material.